The Garage! What a place to store all of your equipment and treasured items that are not in use. Does it need any organization? Or will equipment be arranged according to how their size is? This is just some of the questions plenty of people ask when trying to sort out their garages. So what do you need to do to be able to come up with a well-organized garage? Many people may not be able to know what is involved in organising. 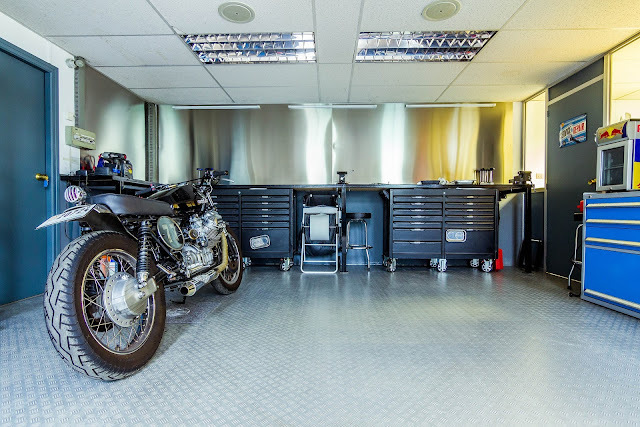 In fact, the process of coming up with a well-organised garage can be such a daunting task making some to give up. The garage can be used to store your car, aiding it from being vandalised while you are away. Also, some of the house equipment that are not in use or will be used later can be put away there in order to provide room for other equipment or furniture in other areas of the house. Here are some of the 7 Great tips for Garage Organization. Many interior design specialists really advice that the small equipment inclusive of hammers, tapes, screwdrivers and spanners, hosepipes and takes need to be hung properly. They should not be in such a way that they don't pose any danger to the house inhabitants and they can be easily retrieved when required. 2. Using drawers and Labeling. Drawers especially come in handy when one is trying to put the small equipment in an organised place. This design offers the option to stack nails, spanner and bolts in different drawers. Labeling also enables you to comfortably reach them in time without wasting time trying to trace where you last had them. Do you have any lockers and bins that are lying somewhere in the house? it may be proper for you to try and put into practice the DIY YouTube you keep on watching and use the bins on garage walls. Doing this makes sure that every small extra space in your garage is well used Pinning the bins on the walls create more storage and give you more places to put any more unwanted stuff. Just as the name suggests, mounting involves hanging equipment inclusive of bikes belonging to family members. Mounting is made possible by buying a hook and rack, installing them where suitable and going ahead and hanging your stuff. This not only applies to bikes but also gardening equipment. Further, the use of lines to hang items can be quite also helpful. Although hooks may destroy the wall linings when being installed, they offer a comfortable and serene garage environment that enables one to easily spot what they need. Moreover, there is an added advantage as most gardening tools have a hole at their rear ends suggesting they can be easily hooked on a wall. Although cleanliness is way overlooked when one is thinking about garage organization, it can be quite vital to your garage appearance and tools appearance. Keeping tools in their right clean state before putting them off can really do the trick. Other vital practices involve doing a general dusting and cleaning of the garage. According to Home Morphing garage refrigerator can be used for storing drinks, chocolates, and snacks so the garage looks tidy. Organisation really does involve styling and appearance. So instead of focusing on how it will be suitable to arrange your garage, also think about how it can be quite helpful for you to color your garage walls. In so doing, the garage remains in a well-maintained appearance that will leave your garage being adored. Following the tips can make your house visitors think that you hired the services of a professional while in fact you just did it yourself. These above tips may just be a drop in the ocean when it comes to the topic of organization. Some of the other useful tips can be found on a number of social media platforms such as Pinterest. Moreover, asking also family and friends for their help while doing organising can be really helpful and save time.